The haunted Adolphus Hotel in Dallas has resident ghosts complete with scary stories of ghostly encounters. Many visitors to the area make a point of stopping in at the famous Adolphus Hotel just to see if they can catch a glimpse of a ghost. Visitors who have spent the night at the Adolphus have reported a number of strange experiences. The 19th floor of the hotel appears to be a hot spot for paranormal activity. There have been several complaints from guests of being woken up by the sound of someone running down the hall outside their room, or by the sound of a band playing music in the middle of the night. When these incidents are reported, the Hotel sends security guards to investigate. However, they find no evidence of anyone being in the hallway and there is never a band playing. The strange thing about these incidents is that there was a ballroom located on the 19th floor of the Adolphus at one time. Is it possible that these modern-day guests are experiencing a residual haunting? In a residual haunting event, events from the past are replayed over and over. It's the paranormal equivalent of watching something on a video tape. These events may be purely visual in nature. or they may only include sounds. These hauntings are associated with a specific location and are usually not connected to the presence of a spirit. Instead, they are associated with events that created strong emotions, either positive or negative. A residual haunting can occur where a tragic event took place or, in the case of the Adolphus Hotel, at the scene of a place where emotions ran high because people were gathered together in celebration. The Adolphus also appears to be the scene of more intelligent hauntings as well. In one incident, a maid was tapped on the shoulder while cleaning rooms. When she turned around, there was no one there. Witnesses have seen doors slam shut, seemingly on their own. The sound of slamming doors has also been heard throughout the hotel. Windows have opened with considerable force on days when there wasn't a breeze outside. Apparitions have also been reported over the years. The Adolphus is haunted by its own White Lady. This type of Adolphus Hotel ghost is associated with a woman who died under tragic circumstances or suffered from some type of trauma while alive. Many stories about the White Lady include the woman losing, or being betrayed by, her husband or fiance. The Adolphus Hotel is located in Dallas, Texas. It was built by Adolphus Busch, founder of the Anheuser-Busch company. The Adolphus welcomed its first guests on October 5, 1912. The 22-story luxury hotel was the tallest building in the State of Texas for a number of years until the Magnolia Petroleum Building was built in 1922. The Hotel underwent a series of expansions, and by 1950 it had 1,200 rooms. During the 1980s, the Adolphus underwent another series of renovations that resulted in the number of rooms for guests decreasing to 428. The Hotel is on the National Register of Historic Places. 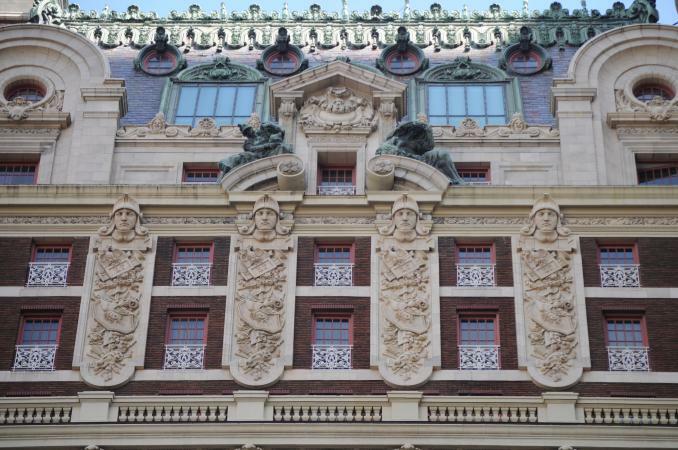 The Adolphus Hotel appears to be home to more than one entity. With the number of accounts of strange things happening at the Hotel, it makes sense that something supernatural is taking place there. Even if there are other explanations for these events, the legend of its hauntings is sure to attract visitors to the Adolphus Hotel.